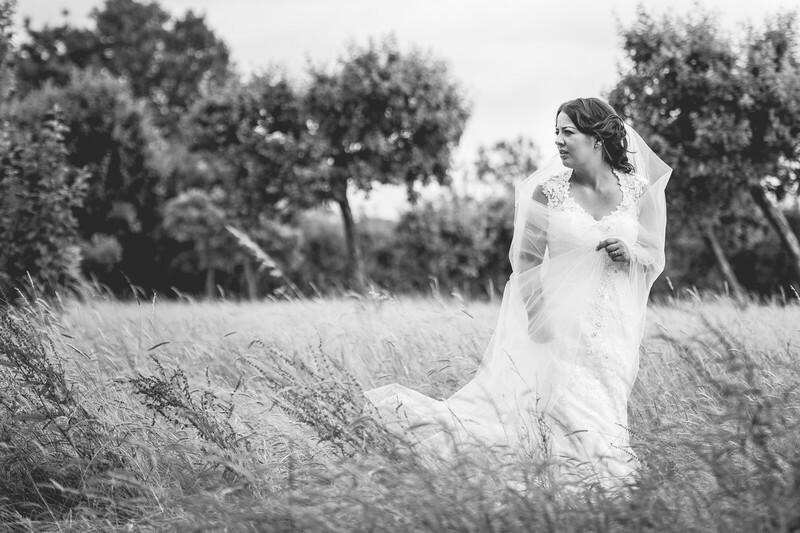 Andrea and Matt got married in their local church and held their wedding reception at the Moat House in Dorsington, which at the time was a up and coming wedding venue. I was lucky enough to be asked to photograph the first ever wedding reception at the Moat House in Dorsington, and it was truly a joy being able to take a fresh pair of eyes to the venue and look at things from an all new perspective. It's very easy to look at other people's wedding photos from a venue and end up taking pictures that are somewhat similar. You can also take inspiration from other photographer's images from various places, but with an all new location, I had a blank canvas. The venue itself was beautiful, a 12th century Manor House with a 21st century conservatory that levitated out over the moat that gives the venue it's name. One of my favourite images from this wedding though came at a very unlikely time. Andrea, Matt and I had walked a short distance from the house in order to take some photos in an overgrown field that's adjacent to the main drive. As I was snapping away, getting images of the bride's cathedral length veil blowing in the wind, the bride's mother called out to Andrea - without thinking, she turned to see what her mother was calling her for. As she turned around, she held her veil close into her body and I just love the cocoon like look it gives, with the bride completely wrapped in her veil in a moment of peace. Sadly, the Moat House in Dorsington was a short lived wedding venue. The residents of the tiny rural community protested against the 'party barn' and after a couple of years of battling various court cases, one of the nicest wedding venues I've worked at was forced to close it's doors to the public for good.